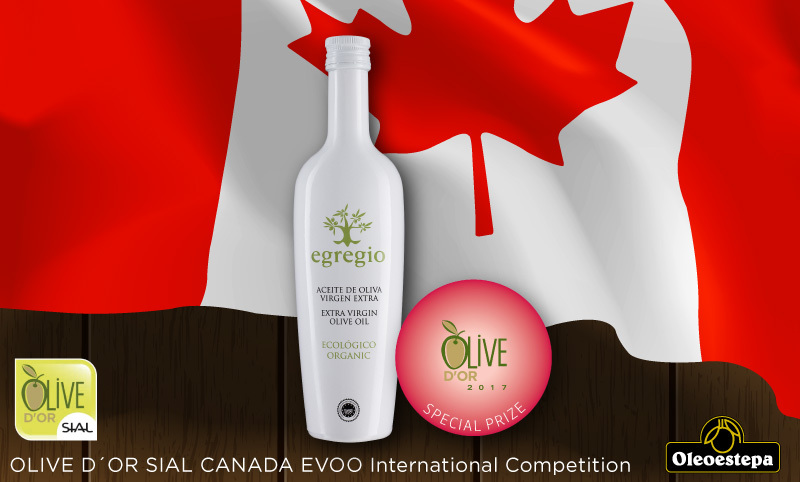 The most important awards in the international extra-virgin olive oil competition in Canada were declared during the celebration of SIAL Canada. After the jury’s deliberations, the Oleoestepa organic extra-virgin olive oil, EGREGIO, was selected as the jury’s favorite. Approximately 100 oils from 15 different countries were registered this year, demonstrating the growing interest of the Canadian market for high quality extra-virgin olive oils. According to the rules established by the International Olive Oil Council, each olive oil had to undergo a blind taste test by a jury composed of olive oil and food experts. EGREGIO is an organic extra-virgin olive oil which possesses the USDA and CANADA ORGANIC certifications in the American markets. It also has the organic farming seal in the European Union (ASAC). The high quality of this organic extra-virgin olive oil is guaranteed by the Council of the Protected Designation of Origin Estepa and its international SIQEV seal, further ensuring its highest quality. Although the time line of this premium olive oil is short (this is only its fifth campaign), it has already taken its place as one of the most award-winning organic extra-virgin olive oils. During this campaign, its high quality has been acknowledged with awards at BIOFACH (Nuremberg), BIOL (the Italian Organic Consortium), the International Los Angeles Competition and more recently at the international contest OLIVE JAPAN.